In this success guide for the QTS numeracy skills test we’ll tell you what to expect and how to succeed, step-by-step. Let’s get started! The ‘secret’ to passing the numeracy skills test is simply lots and lots of practice. There are no short cuts. (Sadly!) You can get hold of practice QTS numeracy tests here. You should definitely check out our numerical reasoning hub – It will be a treasure trove for you in preparing for your numeracy skills test. Download a 4-step numeracy skills cheatsheet. The numeracy skills test worries all aspiring teachers, but this part of the professional skills test can easily be negotiated with the right preparation. We’ve put everything together for you in one place so grab a drink, keep reading and we’ll walk you through the whole thing. What is the numeracy skills test? The numeracy skills test is one of the professional skills tests that must be passed by all prospective teachers. The test is designed to assess a core skill that all teachers need to work with competence (it does not assess a specific subject knowledge). The numeracy skills test checks that you have strong and broad numeracy skills, regardless of what subject you may intend to specialise in. Why is the numeracy skills test so important? It’s pretty simple: You can’t progress from trainee teacher status unless this test is passed. Once you have it under your belt you can proceed towards qualified teacher status. Where do I take the numeracy skills test? You will take your numeracy skills test at one of Learn Direct’s test centres, which are dotted all over the country. Want to find your nearest centre? Click here. Want to book your numeracy skills test? You can do that here. Ok, let’s get into the detail of the test itself. Let’s take a look at both sections in more detail. This section of the numeracy skills test has 12 questions and is audio-based. You will be provided with headphones to hear the questions. You will be assessed on your ability to carry out mental calculations and with this in mind you can’t use a calculator. The questions are individually timed, so it’s imperative that you make your calculations swiftly. You can use a pen and paper for your workings. 1) Familiarity with the test format increases both your competence AND your confidence. This helps you relax on the day and that’s HUGE in terms of boosting your performance. 2) The tests above also include explanations and this is a game-changer for many people. The tests allow you to identify your weaknesses beforehand and show you how to improve. This is transformative for your performance. You can ditch the headphones for this section of the numeracy skills test. You’ll see the questions on the computer screen and you will have to answer 16 questions in 36 minutes. You’ll be pleased to know that you can use a calculator for this part of the numeracy skills test. Expect to be provided with lots of visual information; tables, charts and graphs etc. There’s no single type of question here. Some are multiple choice and some are direct-entry (with you typing in your answers). This part of the test is a standard numerical reasoning assessment. 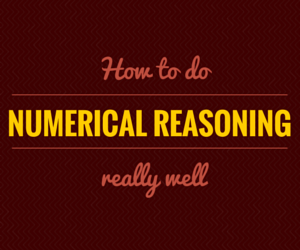 You should check out our numerical reasoning hub, there’s TONS of stuff there that will help you. Practice, practise, practise! This is the fundamental point in your preparation. Practising allows you to discover your strengths and weaknesses and that shows you the areas you need to concentrate on. It will also ensure you get faster, which is a key part of the numeracy skills test. You can get hold of excellent QTS practice tests here. Don’t waste precious time, examining useless data. This is a really practical tip. Always read the question before spending time analysing a table/graph etc. Using this strategy will allow you to quickly disregard data that is not required. This is the key to speed. Use Our Numerical Reasoning Hub. The Hub is there to help you visually make sense of numerical reasoning. We’ve made a series of coaching videos for you, check them out! Keep an eye on the clock. Don’t allow yourself to waste precious marks on unanswered questions. Move through them at pace. Again, you’ll learn how to manage your time effectively by practising and by visiting our numerical reasoning hub. Invest in your future. Prepare. Don’t leave your preparation to the last minute. Cramming is nowhere near as effective as a steady intake of knowledge. Use the time leading up to your test, to your advantage. There is no secret to success. Success is an entirely natural byproduct of doing the right things consistently. In this case, the ‘right thing’ is preparation. What is the pass rate for the numeracy skills test? The current pass rate is 63% – that equates to getting 18 out of the 28 questions correct. Each question is worth 1 mark (no matter how many answer-entries the question may require). When do I learn my numeracy skills test score? Make sure you have a firm understanding of your times tables. Check out this brilliant video for a refresher. The Hegarty Maths channel on YouTube is a good place to brush up on your skills. Check it out here. The main Department for Education page on the numeracy skills test is here. Come and say ‘hi’ on Facebook. We’d love to hear how you do in your numeracy skills test.